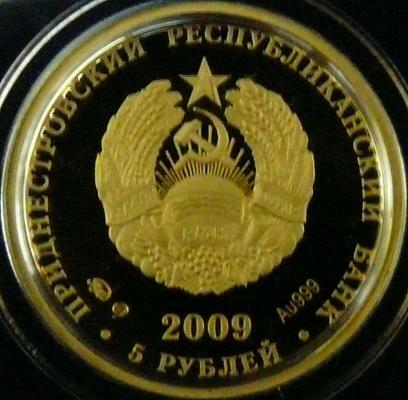 Obverse: denomination "5 RUBLEI" (Cyrillic), coat of arms of the self proclaimed republic of Transnistria (bearing hammer and sickle), inscription "PRIDNESTROVSKII RESPUBLIKANSKII BANK" (in Cyrillic and Russian) meaning "[TRANS] NISTRIAN REPUBLICAN BANK", year 2009, at left mintmarks, at right the gold fineness - Au999 Reverse: laureate bust of empress Catherine II, ensign above the left shoulder, Cyrillic inscriptions IMPERATRITZA EKATERINA II 1729-1796 and, on a ribbon, ROSSIA V ISTORII PRIDNESTROVIA, meaning "EMPRESS CATHERINE II" and "RUSSIA IN THE HISTORY OF (TRANS)NISTRIA"
The coin belongs to a series named "Russia in the history of (Trans)Nistria". The series also comprises the 100 rubles 2007 coins with field marshal Pyotr Rumyantsev, with field marshal Grigory Potyomkin and with general in chief Piotr Panin and from 2008 with field marshal Peter Wittgenstein. The Russian Empire reached the river Nistru in 1792, the year in which the entire Transnistria entered under Russian administration. The territorial extention to the line of Nistru was achieved under the command of marshal Suvorov that succeeded in pushing back the Ottoman Empire yet farther. 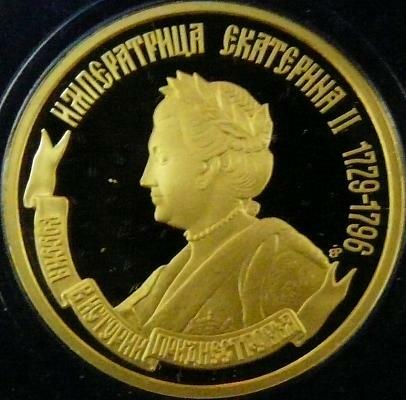 These were the times of empress Catherine II, hence the theme of the coin.